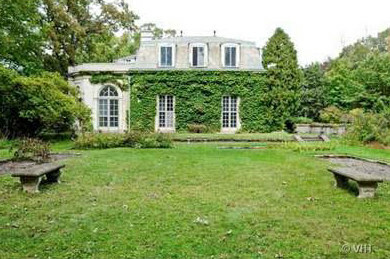 This 1913 David Adler masterpiece is on the market for $2.6 million. 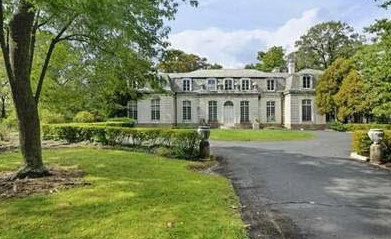 Adler and Henry C. Dangler designed the French-influenced home for Ralph Poole. According to the wonderful book, Classic Country Estates of Lake Forest, Adler may have been inspired by the Chateau Montgiron when designing this home, which is located a few blocks away from the shore of Lake Michigan north of Chicago. 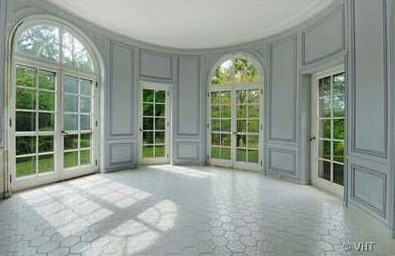 The chateau sits on 8.26 acres of land, providing a substantial frame for such an extraordinary residence. The home is in desperate need of some TLC, but whoever the current owners are, they should be thanked profusely for the care they put into it over the years. 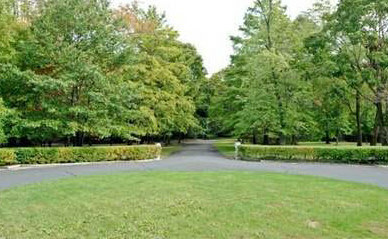 Let’s approach the house from the circular drive. The first thing you see is the magnificently proportioned facade. 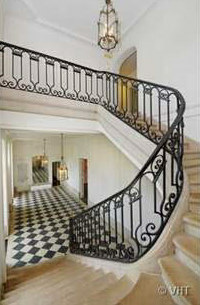 Upon entering the house, the visitor is welcomed by a dazzling foyer, including one of Adler’s perfectly rendered staircases. Except for some staining to the bases around the door, the foyer looks impeccable. However, the trouble begins after the dreamlike entry. Let’s wander into the music room. It is, well, green. However, the essential French details remain, just waiting to be uncovered. An older photo depicts the enfilade procession of doors, with the music room in the foreground. 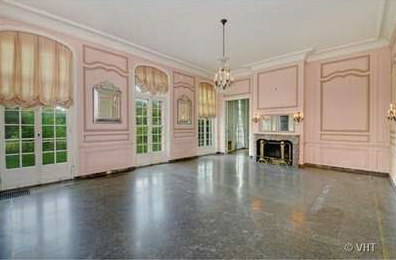 The next room, likely the main salon, is decidedly pink. 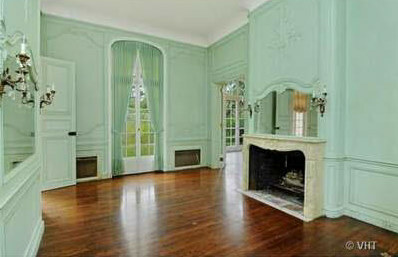 Pouf window treatments obscure perfectly proportioned French doors. Adler surely paces through here in the darkest hours, spectral paintbrush in hand. Oh please, rethink the pink! The library is pretty darned close to being perfect. Nothing a little floor refinishing and wood oil can’t restore. 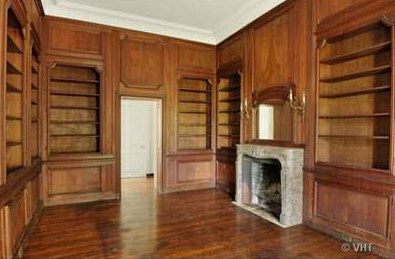 With a bit of restoration, the library will be a best seller. Imagine taking breakfast in the solarium, and watching the seasons change. There is some weather-related damage, but it is certainly repairable. Solarium has nearly wraparound views. A wall-mounted fountain adds whimsy to the solarium. Just add water: Instant joy. Uh-oh, it’s time to tour the dining room. What happened here? A ruin. A magnificent one, but very much a ruin. 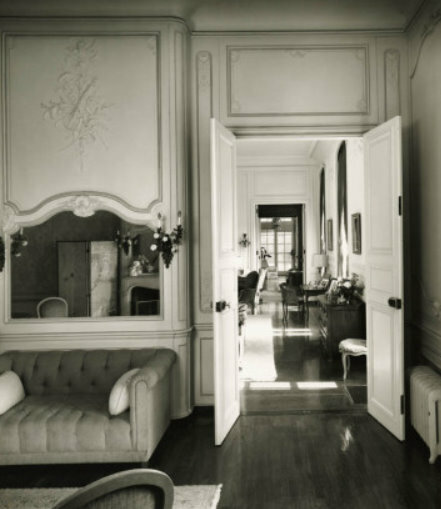 The room is reminiscent of the dining room in the home Adler designed for the Ryerson family on Chicago’s Astor Street. The amazing Louis V influence, the symmetry. Under all that green, the impeccable bones are still intact. It’s REALLY not easy being green. The poor kitchen. Adler must shed ghostly tears when he wafts through here. Yet the possibilities are endless. Nothing that a gut job and some Peacock or Smallbone cabinetry won’t fix. 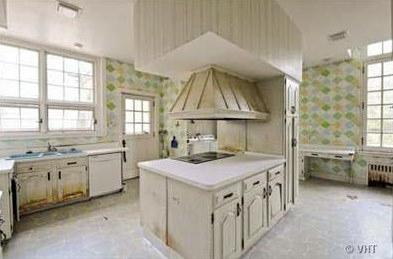 Light filled kitchen seeks overhaul opportunity. 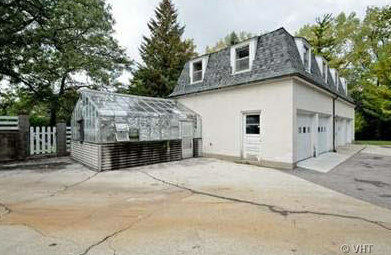 The abandoned greenhouse and the four-bay garage look so forlorn. Imagine the delicate blooms that were once coaxed out of the greenhouse. Garage and greenhouse need love. 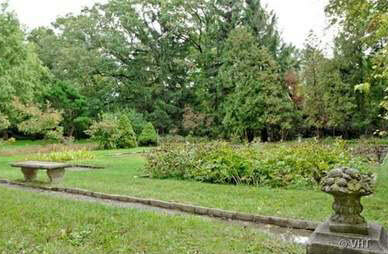 Great “bones” still exist of the formal garden. According to The Country Houses of David Adler, a field of alfalfa once flourished in view of the home’s south elevation. The alfalfa supplied food for the cows that were once housed in the estate’s barn. The barn is no longer extant. Rear elevation shows some damage. Side view, indicating neglected beauty. 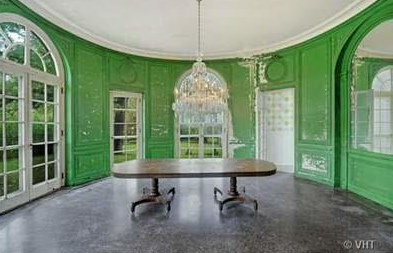 I wish I had the ability to restore this landmark home. Perhaps you do, and will consider buying this treasure house. Here is the listing.